OK, it’s not in London per se but given its proximity, we thought this plaque commemorating Jane Austen’s visits to an inn which once stood in the town of Dartford in Kent worth mentioning. 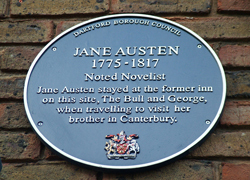 The plaque, which was erected by the Dartford Borough Council in High Street in 2006, commemorates the times Austen stayed at The Bull and George Inn while travelling from the family home in Hampshire to meet her brother Edward Knight in Kent. Edward has been adopted as a boy by a relative, Thomas Knight, who owned Godmersham Park which stands between Canterbury and Ashford. Edward, who married Elizabeth Bridges, later inherited the house and Jane and her sister Cassandra were apparently frequent visitors (at different times) during which time they helped look after their nieces and nephews and visit nearby towns such as Canterbury. Austen is known to have often rested at the inn overnight on her way to and from Kent and at other times simply stopped for a meal.